Rubbles on defueling floor are piled up with sloping up to South. 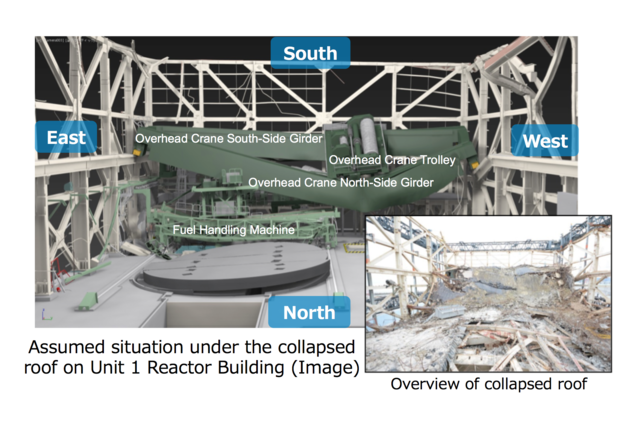 Under the south area rubbles, there are ceiling crane, fuel handling machine and spent fuel pool. In case of dropping the rubble during rubble removal work, the risk which rubble drops onto spent fuel pool, machinery hatch from opening of defueling floor and the risk which radioactive dust disperse by shock of rubble dropping will be generated. In oher words, though counter measures to cover opening on refueling floor and Spent Fuel Pool, but in case south side rubble dropped from high point to refueling floor, the dust might be dispersed by dropping shock. We are searching for the way of minimize risk of rubble dropping or we are searching for shock absorber against rubble dropping which can easily install by remote working with no negative impact to water purity of spent fuel pool.